Greater Philadelphia Bicycle News: Attention all Ped Heads! 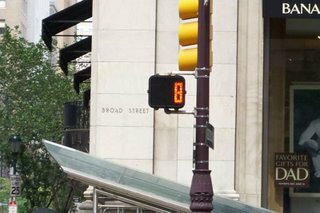 No, its not an optical illusion, the Streets Department really has installed pedestrian countdown signals at 10th/Market and Broad/Walnut. One minor quibble, the countdown doesn't start until the red hand starts flashing (just 7 seconds on Market St), seeing the entire walk phase countdown is very useful. As cyclists in Washington DC know the countdown "Ped Heads" are a great tool if you are trying to "make the light".